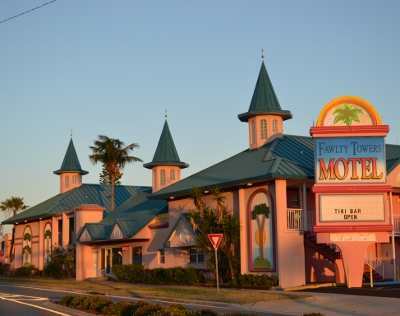 COCOA BEACH, Florida -- The Fawlty Towers Resort located at 100 East Cocoa Beach Causeway in Cocoa Beach, Florida will change to a clothing optional resort beginning May 1, 2012. The resort, which opened in 1988, is located in the heart of Cocoa Beach's tourist district, just one block away from Ron Jon Surf Shop and on the main road leading to Shepard Park, a popular beach park for visiting tourists. A desk clerk at the resort told Brevard Times that the next closest clothing-optional resort is in Kissimmee, Florida.